I'm all about textures, colors and patterns so in any given day I can look as unexpected as the day before. While I was all about ladylike yesterday, today I'm more of an eclectic, snow-bound looking kind of gal. Whatever that means. I'm glad today is Friday. It definitely felt like the first full week of 2013! Don't get me wrong...I am so grateful to have work and be busy but there are definitely days where I can't wait for it to be over. Tonight, I plan to unwind with Gangster Squad, dinner and a drink! And of course, enjoy the Golden Globes this Sunday. Enjoy your weekend! 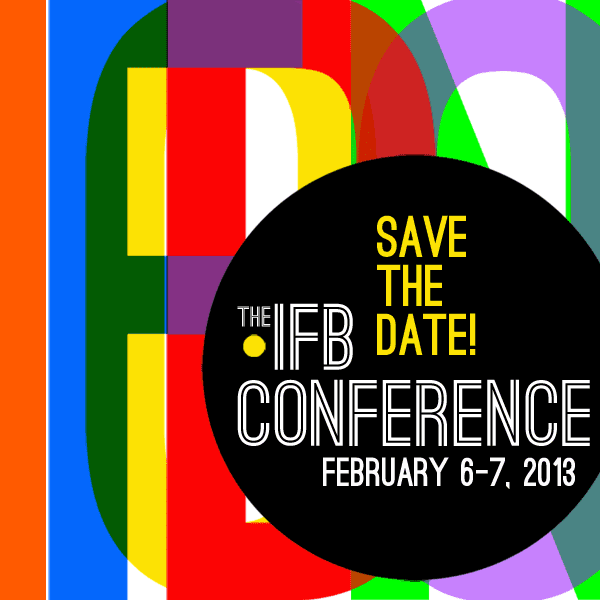 IFBCON - February 6-7, 2013. Day One: 6 panels of marketing tips, content inspiration, business insight, engaging discussions with leaders and more. Day Two: All-day hands-on training and workshops in social media, photography, writing, marketing, and more. love your 'mish mash' get up. it's so cute! 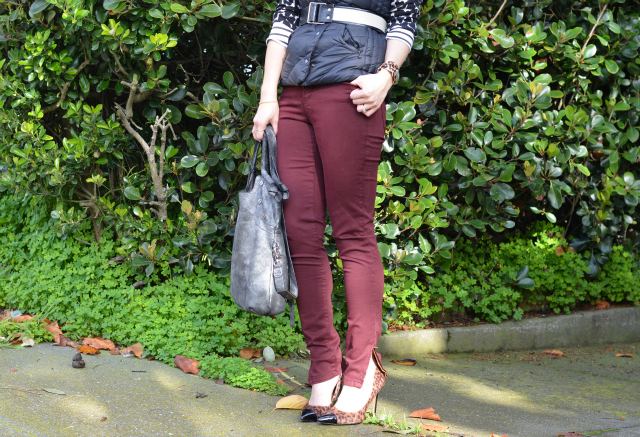 I love that vest too - it's actually a practical one to have! hope you have a good weekend! love it, the pant color is great! Happy Weekend! I don't usually attend the blogger events in February because it's so cold in NYC then. But anyway, I will be looking forward to the red carpet this weekend and Gangster Squad as well. You must tell me what you think of it! Also, I love this look, especially the burgundy Zara jeans and heels. 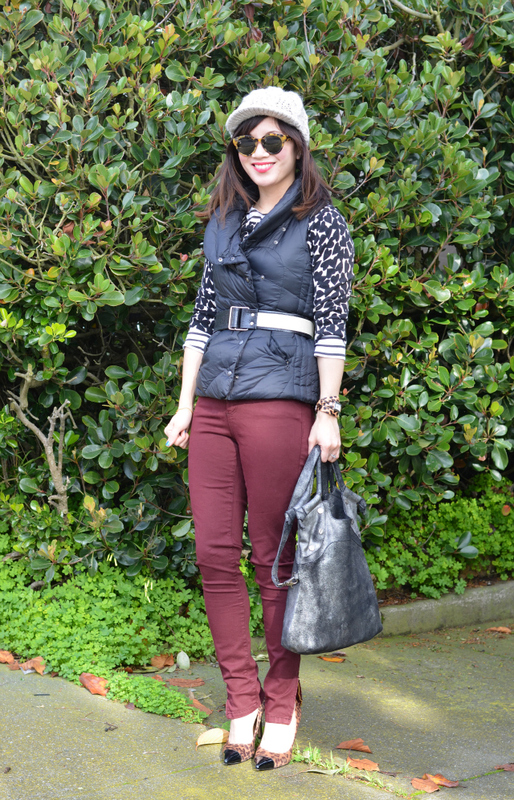 Love how you belted your vest, very chic :) Those cap toe pumps are amazing as well! I'm sooo loving all of the layers. Super cute! Have a beautiful weekend, nancy! 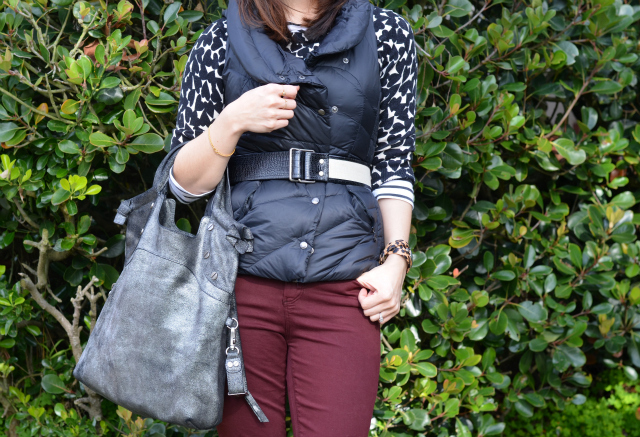 loving all the mixed textures in this look! I just love everything about this casual chic outfit! I wish I could attend the IFB conference! But too bad it's all the way in NY... Now I'm sad :( but on another note, I do love prints, patterns, and textures are well! It's part of my new year's resolution to try and incorporate more of them into my outfits and be BOLD & BRAVE about it haha! My style changes drastically from day to day too, but that's what makes fashion fun. One day you can be over the top glam and the next you can be experimenting with menswear. I think you nailed this look, all of the different layers really work together. Very cute outfit! Love your heels! Love the mixing of patterns and textures and colors! Great combination, I like your vest! Oh this hat is so cute! Wish you a nice weekend, dear! 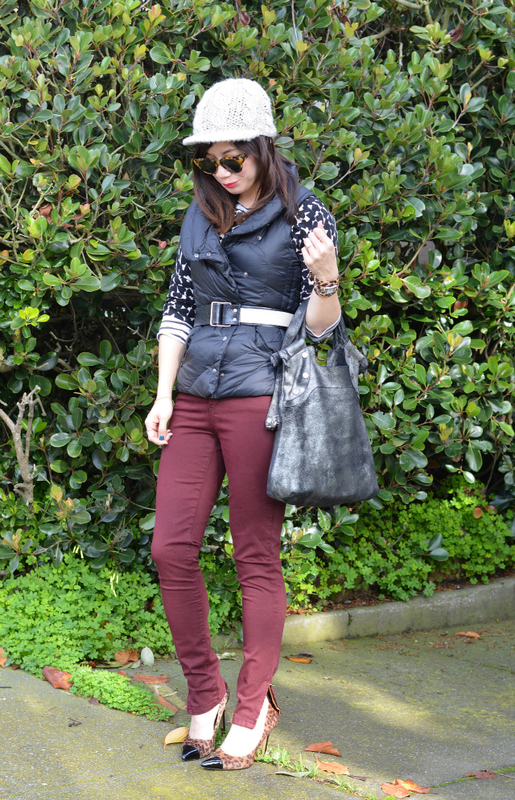 I love how you styled your puffer vest! And those pants are such a great colour. Following you via GFC, hope you do the same. You are adorable. I love your pants. You look lovely. I love the mix of prints and the color combo! I adore the adventurous mix of prints! Love the mix of prints - you pull it off perfectly! The maroon jeans are such a perfect color addition. Love the leopard accents in your outfit! And those sunglasses are amazing! This look is very cool! I like the combination of all these different patterns! You are totally rocking this whole mix of prints! Great outfit! Awesome glam look! I'm loving your glasses and cool sweater! Your knitted hat is so cute! Your heels are to die for! What a great mix of different pieces! I hope you had a great weekend, and I can't wait to see the fashion at the Golden Globes! Liking both yesterday and today...examples of how versatile your styling is! That's what makes your blog so fun :) I kind of do the same thing during the winter months especially...some days I'm all 50s ladylike, and other days I like to do a more layered, street-chic type thing! Hi babes! 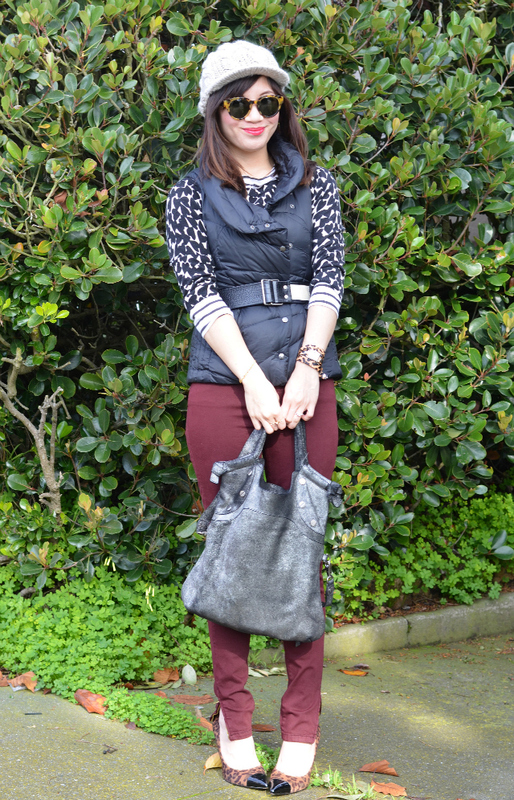 Came across your Blog on The Weekend Diary :) Great style! Check out mine and let me know if you wanna one another on GFC. Your shoes are SO cute! I love the leopard & the cap toe! Adorable!